Last year, my parents took a trip to Copenhagen, Denmark, right before Christmas. When asked if I would like them to bring anything back for me, I requested a “cool” sweatshirt. My reasoning? If anyone asked where I got said cool sweatshirt, I could shout “Copenhagen!” What can I say- I’m a little eccentric. Nonetheless, my parents did indeed get me a cool sweatshirt, and I’ve been able to pretend I’ve been to Copenhagen on several occasions (though by now the word has spread- “don’t ask Kate where she gets her clothes, she just starts screaming names of foreign cities”). But even better than the wearable gift, my mom returned with a recipe for traditional Danish Christmas Pudding. It’s a form of rice pudding, but the base is whipped cream instead of pudding, so it’s much lighter than, say, Cozy Shack. In Denmark, the tradition is to present the pudding in single serving dishes, with a bit of a ceremony. 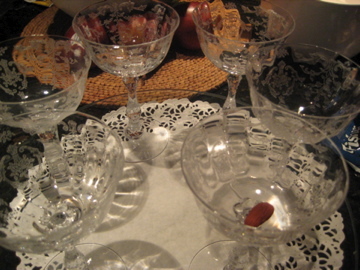 The host/hostess will have hidden one whole almond in the bottom of one serving, and whoever finds the almond wins a small prize. Not only is the ceremony of a roomful of people eating dessert until someone finds the almond /gets the prize pretty fun, the pudding is really nice. It’s not overly sweet, and the texture with the rice, almonds, and cream is much more interesting than regular rice pudding. The acid from the raspberry sauce cuts through the cream to prevent it from being too rich, but you could switch it up to a strawberry or peach sauce if you wanted (though it wouldn’t be quite as true to the tradition). It’s clearly a little late to have this for Christmas, but if you’re having friends over for New Year’s Eve, give it a try. Bring milk to a boil and add rice. Reduce to simmer and cook 20 minutes, stirring occasionally. Remove from heat and cool to room temperature. In small saucepan, mix Marsala and gelatin, and stir over low heat until gelatin is dissolved. Stir in sugar until completely dissolved. Add vanilla and chopped almonds and stir mixture into the room temperature rice. Refrigerate for several hours. 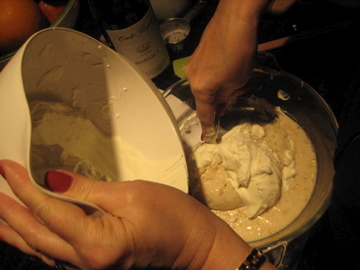 Whip cream until soft peaks form and fold into chilled rice- the finished product will be thick and creamy. folding whipped cream into cooled, gelled rice mixture. Blend raspberries with 1/4 cup sugar and a touch of sherry or Marsala (to your taste). 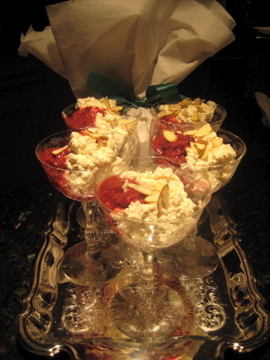 Serve pudding in small, single serving bowls with raspberry sauce and cinnamon on top. Bury one whole almond in the bottom of one of the small bowls. Before serving explain to guests that there is a whole almond in one bowl and that the person who gets the almond wins the prize. This is important- you don’t want someone to choke on the almond, or eat it without realizing it. The tradition in Denmark is that the hostess tries to rig it so the youngest child in the room wins the prize. My laptop “died” so I’m temporarily using a borrowed computer to check e-mail, etc, via webmail. This is a very good entry. If I send you Sven’s e-mail, can you send him a copy? sure thing, feel free to send me his email!